Sage CRM | Bennett/Porter & Associates, Inc.
By far the most easy-to-use CRM Solution on the market today. Customers and prospects have come to expect more and because of those expectations you need to be able to respond quickly to customer’s requests. In order to do that efficiently it is important that you have an application that is versatile and user-friendly and at a cost point that is affordable. Here at Bennett/Porter, we strongly believe that product is Sage CRM. It is flexible and user-friendly, in fact, out of all the CRM solutions we review on a regular basis, Sage CRM is by far the most easy-to-use CRM Solution on the market today. Why don’t you give us a call and we can come give you a preview of Sage CRM and show you how it can meet your CRM needs. Here at Bennett/Porter we have a “practice what you preach” mentality, in other words we use the same software in our day-to-day business that we offer to you. If you are looking for a CRM solution or have been disappointed by other CRM applications, we believe that Sage CRM will be a winning solution for you, go ahead give us a call and we can show you how it can meet your CRM needs. A company’s reputation is judged by its actions, not intentions. It does not matter if the sales person meant to follow up with a client on a particular day, a support representative promised to send critical documentation to a customer or the AR department intended to credit an account. If intentions become missed commitments, lasting and sometimes irreparable damage to the overall relationship can result. Sage CRM automatically tracks and alerts you to your obligations necessary to fulfill your promises and tasks. From the “10,000 Foot” level to a “Boots on the Ground” view, Sage CRM provides accurate and timely information ranging from trending analysis of customer purchases, to specific details of customer service issues. Use Sage CRM to add or modify preconfigured Web based reports or take advantage of Open Database Connectivity and use any other ODBC compliant reporting tool such as Crystal Reports to accurately display data critical to your operations. This is a given. Your company is like no other and so are your software requirements. Many companies sell the same type of products or similar service. What makes your company unique is how you differentiate your business. The value you bring to your clients is based on how well you stand out from your competitors. With the Sage CRM’s open architecture, you have control over how CRM functions; what information is maintained and how it is reported. By setting the standards based on how your business operates, you run your software, not the other way around. 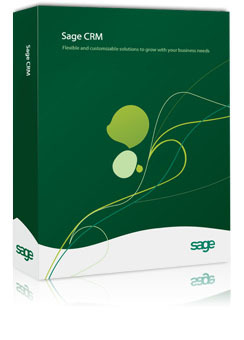 By design, our Sage CRM is intuitive and self contained. Installation, setup and training can take place in weeks as opposed to months or years.